This project included the analysis of a specific organization’s training needs in the area of Web design, and the proposal for an instructional systems design (ISD) model directly applicable to the context. 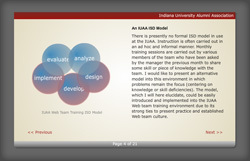 The organization assessed was the IU Alumni Association. For this project, I assessed the needs and context of the organization and learning environments, and created a Flash-based Web site presenting my analysis findings and ISD model proposals. This project was an assignment for a course on the foundations of instructional technology. The following is an analysis document for a theological concept lesson on divine attributes focusing on the concept of omniscience. The context was a local church youth discipleship program with learners that are in high school between the ages of 14 and 19. 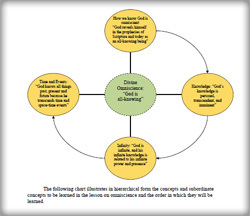 Learner, task, and context analyses were completed through the use of surveys and interviews. This project was an assignment for a course on instructional design and development. I designed and developed online instruction for the creation of education-related blogs. The intended audience was highschool and college teachers. All Web and instructional design and development is my own. This online instruction was created for a course on computer-mediated instruction. 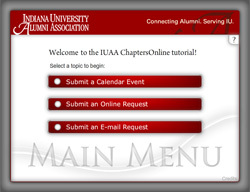 During my internship as an instructional designer and developer at the IU Alumni Association I created a series of instructional online materials related to the alumni association’s online job request software. This instruction was delivered online and via a desktop application to over one hundred volunteers, and I presented the intructional pieces and answered questions at the alumni association’s annual chapter leaders’ convention. For this piece I was the project manager, Flash designer, and Instructional designer, and I led a team of two content editors and two design assistants. In the fall of 2009, I was the teaching assistant for both the online and residential graduate class Instructional Technology Foundations. 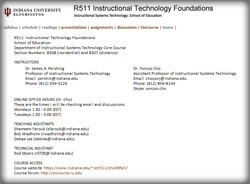 This is the first core course taken by doctoral and masters level students in the Instructional Systems Technology program at the School of Education at Indiana University. As a teaching assistant, I assisted in the creation of the syllabus and course outline, suggested readings for class sessions, moderated all online student forum discussions, responded to online technical inquiries, facilitated in-class discussions, and participated in all class meetings, online chats, online presentations, and weekly staff meetings, and assisted in the grading of online and residential student discussion and group work. 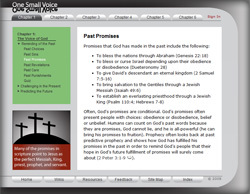 I have written several chapters for a book on biblical prophecy entitled One Small Voice: The Voice of God in Prophecy. This book is instructional in nature, and deals with the themes of prophecy and the lives of the prophets. It is written for a non-scholarly pentecostal Christian audience. I later used the outlines and chapters from the book to create face-to-face discipleship study group materials and a constructivist online learning environment. The three examples given below are three treatments of the same concept lesson (book form, face-to-face discipleship groups, and media-rich Web instruction). I led a 15 week face-to-face discipleship group using materials and themes from One Small Voice in a local Assemblies of God church in Bloomington, Indiana (Cornerstone Christian Fellowship). Group attendance averaged around 10-12, ages 40-82 (more than half were over 70 years old, and had been in church most of their lives). I utilized a cognitivist/constructivist pedagogy, and emphasized the use of examples from scripture. Lessons were loosely structured, and the learning environment was learner-centered (questions and discussion were typically universal). I also created a model lesson for an online constructivist learning environment meant to be accompanied by an instructional student-created wiki. This project was for a class on instructional systems development. All content, media, graphics, and coding is my own. The intended audience is college students enrolled in an online or blended classroom focused on Biblical prophecy. The Web site is intended as a substitute for a textbook, and has various writing assignments and quizzes for assessment of learning. 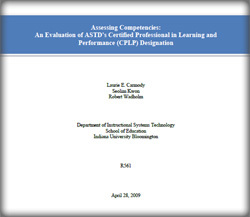 With a team of two other graduate students (both in IU’s Instructional Systems Technology doctoral program), I wrote an evaluation of ASTD’s certification processes and requirements. The American Society of Training and Development’s (ASTD) Certified Professional in Learning and Performance (CPLP) program is purported to be based on the ASTD’s competency model, a model which outlines foundational competencies, roles, and areas of expertise in the field of training and performance improvement. This study seeks to uncover the relationship between the competency model and the CPLP knowledge exam questions and work product submissions (two of the major instruments used by the ASTD to test for competency of CPLP applicants). A mixed qualitative-quantitative approach is used to identify themes, quantify relationships, and assess questions and guidelines. Multiple raters (including myself) independently analyzed the data and identified key themes, and Cohen’s Kappa coefficient was used in measuring inter-rater agreement. The study concludes that several discrepancies exist between the competency model and the knowledge exam and work product submission guidelines. Recommendations are given for possible improvement of the CPLP program, including further emphasis on personal competencies and the role of learning strategist in the exam questions and work product submissions, and a reassessment of the place of knowledge and recall in the competency model. For this project, my role included analysis of primary documents, review of the literature, evaluation of the work product submission guidelines, all of the statistical analyses of inter-rater reliability, writing and editing. 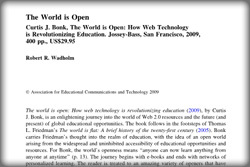 I wrote a review of Curtis J. Bonk’s 2009 book The World is Open: How Web Technology is Revolutionizing Education. The review was published in the scholarly journal Educational Technology Research & Development. In this review, I evaluate Bonk’s thesis of an open world and the effects of Web 2.0 technologies on education today, and elucidate key themes from the book.